The Sonus SBC 1000 delivers robust security while offering unparalleled interoperability between disparate networks. Smaller businesses and branch offices can now enjoy the same industry-leading SBC technology used by large service providers in an appliance designed specifically for their unique needs. A wide range of real-time communications needs are addressed through the SBC 1000’s flexible configurations. Support for concurrent sessions and connections to legacy telephony devices can be expanded via a simple license, eliminating the need for a truck-roll and on-site technician. The SBC 1000 features integrations with leading unified communications vendors. It is qualified for Microsoft Skype™ for Business and can be used as a Survivable Branch Appliance (SBA). Microsoft Skype for Business Cloud Connector Edition can run, embedded, on the SBC 1000. The Ribbon SBC 1000 provides smaller business and branch offices the same robust set of security and interworking features enjoyed by large service providers. It’s many configurations and integrations provide the flexibility to meet changing IP telephony demands. Certified for Skype for Business as a Gateway, Survivable Branch Appliance, and Session Border Controller, in addition to Microsoft Office 365 Exchange Unified Messaging qualified. The Sonus SBC 2000 adapts to meet changing needs. Support for concurrent sessions and connections to legacy telephony devices can be expanded via a simple license, eliminating the need for a truck-roll and on-site technician. The SBC 2000 integrates seamlessly with leading unified communications vendors It is qualified for Microsoft Skype™ for Business and can be used as a Survivable Branch Appliance (SBA). Microsoft Skype for Business Cloud Connector Edition can run, embedded, on the SBC 2000. Medium-sized business need to secure their IP telephony as it moves onto their data network. Service availability is paramount and telephony traffic anomalies have broad-reaching effects. The SBC 2000 helps ensure communication go through smoothly and securely, integrating with leading UC vendors in an array of environments. The Sonus SBC 1000 is purpose-built for midsize enterprises and branch offices, delivering robust security while offering unparalleled interoperability between disparate networks. Smaller businesses and branch offices can now enjoy the same industry-leading SBC technology used by large service providers in an appliance designed specifically for their unique needs. The SBC 2000 configurations are designed for ease of deployment and growth. Both session and port expansion can be remotely enabled via a simple license, eliminating the need for a truck-roll and an on-site technician. 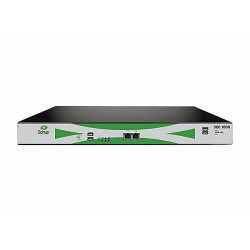 Sonus SBC 1000 Gateway provides small and medium-sized enterprises with legacy voice infrastructure a secure, reliable path to VoIP connectivity with a full range of SIP service provider environments.